The follow-up to the dizzying, dense Sgt. 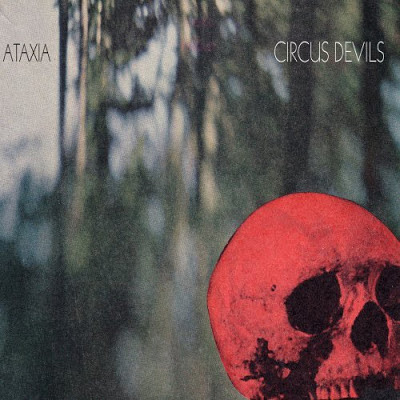 Disco, and the first Circus Devils LP to hold a Halloween release date since Pinball Mars, Ataxia is another sonic balancing act between Pollard and engineer/instrumentalist Todd Tobias. Returning on this too, after a 2 record absence, is Tim Tobias on guitar. Ataxia is a two-faced record. The A-side finds Circus Devils returning to more abrasive sound attacks, and straight-up hard-rock twists found on their first two LPs. The B-side, however, feels more convoluted; a batch of serene, yet unsettling (and disappointing) drones reminiscent of the tossed-off effort that was their LP Five. Also, Ataxia showcases Todd Tobias' dying need to finally cut loose on the drums! (see Side-A). Under Review- 3 Ambiance turns to what sounds like looping metallic blades and backwards looped record scratches. Pollard's pretty strong with the vocals on this. Intriguing opener. I-Razors- 4 Drums fade up and into lo-fi metal! Song constantly falls apart and comes back in. The closest Circus Devils got to playing a math rock song too. In 2013, the Circus Devils' film of similar name also saw release. So put that in your back pocket. Freedom's Monster- 3 Nervous, backwards loop track complete with repetitive dog bark. Yup. Dank, muted chords chug the song along. Never really breaks from its steady, taught confines though. That's The Spirit- 1 Bridge-gap song that lasts 40 seconds. No harm here, but nothing really at all. Backwash Television- 4 A drum intro that make you think, hey is this the '90s? Then Pollard jumps in. Hard-rocker with pounding guitar accents. Dig it. The Girls Will Make It Happen- 5 Dance party somewhere in between a bad dream and a midnight movie screening. Nervous, popping, post-punk Circus Devils style. May cause epilepsy, and repeated listens. Mayflower Brought Disease- 3 What a great Circus Devils title. Mid-tempo tune that sounds like a Pollard solo leftover, except for the constant, distracting robot chomping noise, and frantic outro. Great harmonies on that outro by the way. Stars, Strips, And Crack Pipes- 4 Dark, sweaty repetitious guitar verses into more free formed vocal-less choruses. Song becomes oddly catchy, with the looped Uncle Bob "Woooowooo"s in between Pollard's spoken word delivery. Ataxia- 2 Two minute instrumental piece helps let the LP breath after a handful of solid songs. Tobias plays piano over cold ambiance. Decent length and feel, but forgettable on its own. Nets At Every Angle- 5 This song feels wrong. Dank and vile almost. A track that reaches into the depths of the magic hat, and pull out all the stops. Melvins-paced cyclical stomp, whirling noises, baritone Pollard vocals. The best part, Todd Tobias loops whistles of "Entrance of the Gladiators," throughout. You know!The Circus song! Strangely, this makes it. Second part of the song is lonely, barren, and beautiful. Hi, I'm Martha, How Are You?- 2 What a way to kick off Side B. Sci-fi doom backing track. Reminiscent of a bad flashback scene from The Twilight Zone with drawled vocals. Snoozer. Lunatic Style-1 This one's just boring. Whooshing loop, organ nightmare music. Soundtrack music to a dark castle setting, but who wants to listen to it? Pollard speak-sings. Waste of time. Get Me Extra!- 3 Sounds like warped middle eastern science fiction, that eventually turns into more of an intro to an '80s action TV show. Pollard speak-sings in declarative tones. Intriguing, if not the first sign of pulse on Side-B. I Found The Black Mind- 2 Several types of drones, drums pound as if they were barrels in an abandoned factory. Pollard adds some words. Moody and cold, but ultimately unsatisfying. He Had All Day- 3 Acoustic plucks over drones. Pollard delivers strong vocal performance. Feels like a decent solo demo fleshed out on the spot, as Tobias adds ambiance. Fuzz In The Street- 1 The Epic of the LP! 6 and a half minutes! Part 1 is a bumbling drum fill stuff part with deep Pollard vocals. Song then breaks out into what sounds like a switchboard short circuiting. Essentially, a platform for Todd Tobias to showcase his sound collages. A long, unwelcomed haul to undertake. Rat Face Ballerina- 4 Hammer-on guitar anthem played, unaccompanied, as Pollard delivers vintage vocal bellowing. Sparse with just the vocals, and buzzing electric guitar. Solidly closes out this sordid affair.